Meet my new, heavily upgraded Digital Audio G4! Discussion in 'PowerPC Macs' started by ptdebate, Jan 9, 2015. Boy, is this thing a beauty. Digital Audio 466 upgraded with a 2GHz Newertech CPU, maxed ram, and a 128GB SSD Boot drive. It positively sings in Tiger, and when I upgrade its GPU, it will conquer Leopard. The only downside is that I traded my beautiful TiBook for it. I'm not complaining though! This thing is marvelous. I'm partial to the DA, as it was my first G4 tower. I suspect it is a screamer with the 2ghz processor. The only downside to these(and Quicksilvers, which I also love) is that the RAM maxes out at 1.5gb. At least you get the benefit of 133mhz RAM, though. Once you get Leopard installed, upgrade the graphics card to a 9600XT. It takes about 5 minutes to(reversibly) modify the Mac edition of this card(unless you need ADC support, in which case it takes about 15-30 minutes depending on your soldering skills, and is irreversible) to work in a DA or Quicksilver, but gets you Core Image support. That makes a HUGE difference in how well Leopard works, plus gets you all the eye candy like the translucent menu bar and "ripples" when you add a widget to the dashboard. I actually own a 466MHz DA, and I have a PC flashed FX5200 in it right now. I just wish I had a better CPU for it! It's a great contender for upgrades. Good call, bunnspecial, although I'm somewhat drawn to the 9800 due to its low price on eBay. Have you tried it out in a G4 before or heard of anyone else doing so? Also, do you still get core image support If you use the taping method? I'm using a 9800 Pro with an A1006 ADC-DVI converter for my 20" Cinema Display. I get all the Quartz stuff, but I mainly have the eye candy shut off for performance on Leopard. Nice Mac BTW. My QS is using a Sonnet 1.2 (at the moment). I've not tried a 9800, although I suspect that you would have issues with the Mac version of it since the card appears to make full use of the longer AGP slot on the G5s. A flashed PC 9800 would probably be alright(although check the flashing wiki to make sure the ROM and all the other relevant support are available for it if you go this route). The 9600s are nice because they plug right into the AGP slot with no overhang or other problems(as long as you tape off pins 3 and 11). I think that I paid $20 or so for the last 9600 I bought. And, yes, Core Image is still fully supported even with pins 3 and 11 taped(or otherwise disabled). Since I use an ADC display, I also modified mine to power an ADC display. This is really simple to do and the only thing you lose is the ability to power up the computer using the power button on the display(cards meant for most G4s use pins 3 and 11 for the power-up signal from the display). There's also a small quirk in that the display has to be manually powered on before powering up the computer, but the advantages of the card outweigh this enough that I can live with these quirks. And, of course, if you're not using an ADC display, this won't affect you at all. It looks like eyoungren posted about his experience with the 9800 while I was typing the above. Listen to him, since he's used the card and I haven't! Just to be clear…there is a G5 version of the 9800 Pro that shipped as a BTO option. ATI, however, made a G4 compatible version that was sold retail. That's the version I have. The one for the G5 won't work in the G4. The difference is that the G5 version is a blue card and the G4 version is red. Additionally, the G4 version required additional power. There is a Molex connector built into the board. You'll need to have a spare molex connector as power from the AGP slot only is inadequate. there is a G5 version of the 9800 Pro that shipped as a BTO option. ATI, however, made a G4 compatible version that was sold retail. That's the version I have. I didn't realize such a beast existed, as I'd always heard that the 9700(BTO for the FW800 MDD G4) was the only G4 card that supported Core Image. I'm incredibly happy with the 9600, but am going to now have to keep my eyes open for a G4 9800. By the way, I'm not sure that 9700 will work in anything but an FW800. I've never actually seen the card, so am purely speculating on this. With that said, between computers and my parts box I have examples of every stock, BTO, and retail G4 card save for the Geforce 3 and the Radeon 9700(and the 9800, as I've just found out). The FW800s have an extra power socket(identical to the ADC power socket at the front) that sits at the back of the AGP slot. This is only present on the FW800, and no card I've had has connectors anywhere close to this extra socket. If I had to guess(often a dangerous thing) this socket probably provides extra power to the 9700 in the same way as the molex connector on the 9800 does. I have a GeForce 6800 Ultra in one of my G5s. 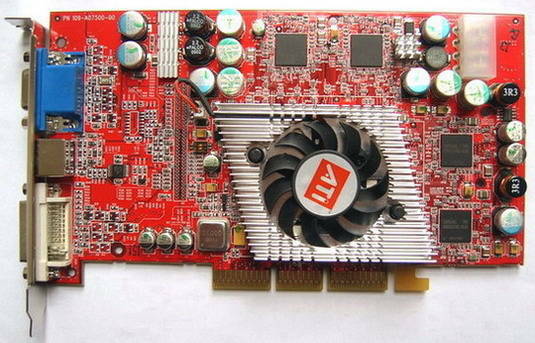 This is a double-height beast of a card-I think it was the best BTO card for the G5, and the second or third best available behind the Radeon X800 and X850. The 6800 does NOT have ADC out, but still engages the ADC power tab on the G5 logic board. I've always assumed that it does this in lieu of requiring an extra power connector(the PC equivalent actually requires two molex connectors)-especially since the only Molex connector in a G5 is the one going to the optical drive. The Mac ATI 9700 can work in any AGP 4X PowerMac. So, when I moved from Dallas, I sold a dude a bunch of my G4 parts and pieces, including a Cube and a 2ghz G4 Digital Audio. I didn't have room to bring it with me to the DC area, and I always wonder how long it will last or if it would continue to get passed around. Seeing that ptdebate is from Dallas, I'm half curious if you ended up with my old machine - no way to know for sure, to be honest. I had that thing souped up with an SATA card, flashed 9800 pro, superdrive, etc. No SSD though. It was awesome, but way too loud for me, louder than the G5 I use often. Do you know what purpose the extra power socket on the FW800 logic board serves? That's a crazy coincidence, Nathan! When did you sell it? The guy I bought it from said he upgraded it himself and it appears that the video card has never been upgraded. Additionally, the sata SSD is mounted to the ATA bus, not PCI unfortunately. It sounds like it is just a coincidence then. I sold it over two and a half years ago. The guy was going to use it to stream audio for his church service or something like that. Your post just made me wonder. And get a SATA card for that thing! Make sure you search for a Mac version as ATI made both a PC and a Mac version and you can't use the PC version in your Mac. Also, the base version is 128MB, but there is a special edition version (which I will hunt down and dominate at some point) which is 256MB. I can tell you where to avoid looking though. There is a seller on Amazon that offers refurb 9800 Pros for around $50. The refurbs are cheap (I broke a part off mine just by handling it within 5 minutes of opening the package). The fan on my card died a few months after using it. Fortunately, I had a VGA cooler, but the radiator blocks one of my PCI ports. So, if you can try and find one on eBay. But be careful because there are a ton of non-Mac ones on eBay. Just out of curiosity, do you remember the guy's name? The guy I bought it from was a church guy also...although I don't remember him specifying that he was the one who did the CPU upgrade now that I think about it. It does indeed have a SuperDrive and when I get home I'm gonna check inside for an unused SATA card...this will be crazy if it is indeed the same one. Also, thanks eyoungren and bunnspecial for this very helpful back-and-forth. I think I'm gonna keep an eye out for one of the 9800s. I've heard they have heating issues, but they're not expensive to replace so I'm not worried. I hadn't heard that (heating issues). However, I will say this. After the Mac warms up I get little artifact issues. Little red and blue garbage lines pop up on the screens. If I move a window over them or change spaces they will disappear for a while but always reappear in random spots. I have attributed this to that little part that snapped off my board. There is a way to compensate however, and that is to use the ATIcellerator pref pane to underclock the card. However, given the improved cooling that I now have (I cut a hole in the bottom of my Quicksilver's case and put a high CFM fan there) this artifacting has not been that bad lately, so I have not underclocked the card. So…if heat issues are indeed a problem then maybe my card is ok and that particular part is irrelevant. Something to consider. I still intend to replace the card with a 256MB version when I can. Note, I tried taking a screen shot to show you the artifacting, but interestingly enough it does NOT show at all in a screen shot! Very strange! So, here's what it looks like with a shot from my iPhone. Thanks for the extra info. Is there anything to look for specifically on the Mac version to differentiate it from the Windows version? This was one of the first results that popped up when I was searching Ebay, and it looks a heck of a lot like your card(I'm not buying it-I bought a 22" Cinema display earlier today which blew the last of my Mac budget for the month). AFAIK there is no visual clue that will identify the difference. When I was looking for my card what I did was to make sure my Google searches included Mac and G4 in them. Of course that does not guarantee that you won't get PC cards in your results, but I found that most eBay listers AND Amazon listers were careful to indicate compatibility in their descriptions. One of the major reasons I went with the seller on Amazon was because he was identifying these cards as Mac refurbed cards (in box) and his picture for them showed the Mac version of the ATI retail box (it says "Mac" right on the box). A big tip off on eBay listed cards is when the seller gives a description of Windows/Direct-X compatibility - because the card came out of the seller's PC. You'll also note that the 256mb versions are seriously hard to come back in the Mac version and if you find one the price reflects the rarety. eyoungren, would this be an example of one of the cards you're looking for? No. That's a 9800XT Pro, not a 9800 Pro. Notice that the card is blue? That's because it's for a G5. I imagine the seller put G4 in there because you can probably tape off the pins, but I don't know. It doesn't look like it would fit in my AGP slot. I've avoided using G5 cards because I didn't want to get into taping off pins. I'm liable to screw it up. I could probably burn water if I tried hard enough. I found the same with my 8500-there's very little to distinguish the Mac and PC versions of the card. Mine came in a box lot with a Mac GeForce 4 Ti(really easy to ID since it has an ADC port and is about a foot long) and a bunch of Mac games, but I still wasn't sure until it got here and I plugged it into a computer. Fortunately, since the whole lot cost me what the Ti by itself normally sells for, I wouldn't have been too unhappy if it had turned out to be a PC card. I was thrilled to get the Mac one, though. I'm grateful to several members here as a lot of the stuff I have for my QS has been free or very low cost. All stuff, I could NEVER afford at retail price, or that would have taken me years to get. My A1006 was free. These converters are around $100 a pop on eBay and you're lucky if you find one at that price! The dual CPU cost me $25 and I got it in a trade with another member for a dual that would not fit in my QS. The QS alone was $50 and a trade of three iBook G3s, with a monitor, keyboard and mouse. And a lot of other stuff too. So, all the way around this forums members have been very good to me and I appreciate it very much. I bring that up as a prelude to another suggestion. One of the free video cards I got was a PCI Radeon 7000. That card is driving both of my Gateway 18" monitors. As a good all around card this thing rocks! It's been stable, just works and I have had zero issues with it. If you can pick up a 7000 cheap (they are not that expensive) as a secondary display card I highly suggest it. It's DVI and VGA and delivers solid performance. I don't use my QS for any serious gaming so high performance from my video cards is not a high priority. I need/want four displays because I use my QS for design/media and it's a very nice feature to be able to have palettes and windows on displays other than the main display. So, all the way around both of these cards work for me. And, I will get around to flashing that NVIDA card Intell suggested some time soon. This QS is capable of six displays and I WILL get there! I've done five already, LOL! On that note, does anyone here have a quartz extreme (and possibly core image) card compatible with my DA that they'd like to sell me? I'd much rather buy from someone on this forum than an anonymous person on eBay or Amazon. If you have such a card or know someone with one, point them my way. The purpose I need it for is light 720p video editing in iMovie HD and possibly a little 720p playback in VLC. Unfortunately, I don't have a spare card at the moment or I'd be happy to set you up. The first one they sent me was actually DOA, but sent out a replacement promptly and insisted that I not send the first one back. No connection with the seller, other than the fact that I've bought from this particular listing. Without having one in hand, I really don't think that this card will fit in a G4 due to the length of the AGP connector. The G5 GeForce 5200(which I briefly considered putting in my QS since I have a couple lying around) has the same problem.